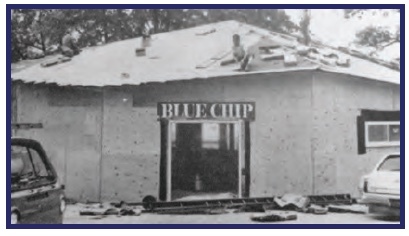 Here is a PDF overview of the E Blue Chip history. The E Blue Chip Regatta is the Pewaukee Yacht Club’s signature event and unique in several ways. It’s the only annual regatta we host where competitors must qualify to receive a coveted invitation. The result is a 3 day race series of the highest level of E Scow competitors from around the country. The regatta has been sailed on Pewaukee for over 49 years by the absolute best E Scow sailors in the world. Invitations are sent based on performance in high profile regattas during the current season. Scroll down for more history. The real draw of this event is our guest skipper which sails under the sail number " ? ". 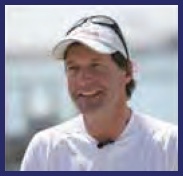 The invited guest is typically a world renowned sailor which has earned Olympic medals or world champion honors across all forms of sailboats from Americas Cup yachts to the 16' Moth. They all know the prestige of sailing in this event. . It’s fun to see how fast the guest picks up on the nuances of boat handling and characteristics of the scow. Yes, the guests do occasionally win the regatta. In celebration of the 50th regatta, we are inviting 20-30 past mystery guests & honorary class legends back to compete against each other in this all-star event. We will provide all the boats and crew. This is a popular 28 foot racing sailboat sailed with 3-4 people. The boat is exciting to sail and extremely tough to master which attracts so many top tier sailors to this event. - 1921 There was discussion in the scow community to develop a Marconi rigged boat that did not entail the expense or crew demands of the A or it’s cousin the B boat. Arnold Meyer Sr. of Pewaukee began work on drawing up scantlings of a 28 foot scow that required a crew of 3 or 4. 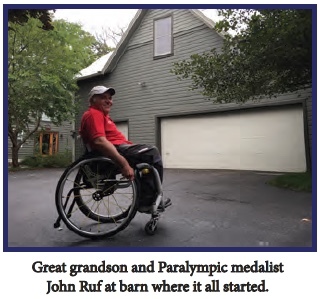 A rough proof of concept was built in converted horse barn on Rocky Point. Arnold’s barn still stands. Take 2 left turns out of PYC, down Rocky Point Rd., drive to the end and see where it all started. - Nov.1, 1923 ILYA approved Arnold’s scantlings which allowed builders great freedom in design. Pointed bows, centerboards and single rudders were often seen on the lakes in the early years. -1924 Three builders Palmer, Johnson & Jones LaBorde began offering their versions of the E Scow. Price was set at $850 including sails. 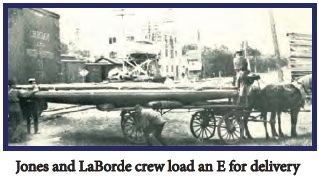 - August 1925 First ILYA E scow regatta at Lake Geneva was won by Albert Gallun/John Pritzlaff of Pine Lake, Wi. - 1927 21 E scows sailed in the ILYA Championship regatta. The E Scow had taken off. - 1949 Dacron replaces cotton sails. 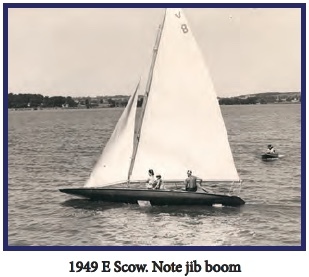 - 1954 International Scow Association, precursor to the NCESA is formed by Harry Melges Sr. & Bus Maag. Marylyn Melges is designated as I.S.A. secretary. - 2001 Bob Biwer V222 with experimental foil rudders, wins E Nationals at Torch Lake. Foil rudders are adopted following year. - 2005 Three experimental boats with asym. chutes sail but are not scored in E Nationals at Egg Harbor. Bill Lieber V95, Eric Wilson V777 and Doug Love MA31 take 1st, 3rd and 4th. Asym chutes are adopted following year. Three good friends from Pewaukee had an idea. 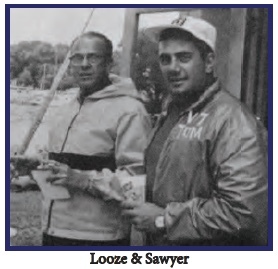 Jim Klauser, Terry Lentz and Tom Sawyer decided to organize the first E Blue Chip Regatta, fashioned after the “C” Blue Chip started 8 years earlier by John Looze from Pistakee Lake. The idea was to attract the best E scow sailors in a post season race and settle the controversies which developed over the year. A committee was formed to decide which sailors should be invited with determination based on performances at major regattas throughout the season. To keep things honest, a Mystery Guest would be invited to square off against the E Scow hotshots. The idea took off. 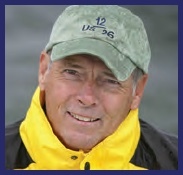 The three friends continued to run this regatta for several years and then asked Coleman Norris if he would take on the task. Fittingly, John Looze was the PRO for the first E Blue Chip on Pewaukee. The original Mystery Guest cancelled his invitation just prior to the event. Tom Sawyer, a designated “C” boat champion stepped in as our first Mystery Guest. As timing would have it, the PYC was adding our current great room during the regatta. Cocktails and meals were served on humble sawhorse tables. Everybody should get the chance to be a "Mystery Guest" at some point in their life. Here's the gist of it: sail with a crew of four in one of the fastest and most developed one design classes in the world in big breeze against the best sailors in that class on a lake with a deep rooted sailing tradition that has made it the "heartland of American sailing" for many years. On the surface the Mystery Guest's role might seem pretty obvious - but as the late Roy Disney used to say, "The devil is in the details." 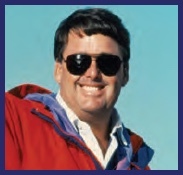 "To judge the quality of E-Scow sailors is to index the very best that American sailing has to offer: National, International, World and Olympic Champions and legends are scattered across the historic records. Pewaukee’s strong scow tradition and ideal location (smack in the middle of Wisconsin and ILYA) makes it a perfect stage for an ultimate showdown between the top sailors in the class from across the country." You'll have a great time. The E-Scow is one of the most refined one design classes in the world - it's on par with the Star. You'll do great, just don't let them over serve you. ​If on a mobile device, use the 'hamburger' menu in the top left to navigate. 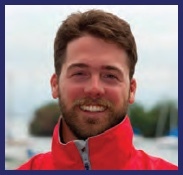 The Blue Chip Regatta is hosted by the Pewaukee Yacht Club in Wisconsin. The E Scow is a 28 foot lightweight racing sailboat built by Melges with an asymmetric spinnaker, sailed by 3 to 4 people that can easily reach speeds in excess of 20 knots. Each year, an elite, international sailor is invited as a special guest that is kept a mystery until just before the event. We provide the sailboat and the crew. If you love sailing, you must follow this event.